Earlier this summer, while visiting family in the Midwest, I decided it was time. For the past twenty-three years, my wedding dress has been carefully persevered in a sealed box, neatly stuffed with tissue paper and form-shaping pieces of cardboard. During my family’s years of moving for graduate school, my parents agreed to store “the dress” in their attic. Standing in my parent’s guest room, looking at myself in my wedding dress, memories from that season of life flooded through me. Thoughts of what I would like to say to that younger woman formed in my mind. For someone who felt she didn’t have a sense of style as a 20-year-old, you picked a beautiful wedding dress. 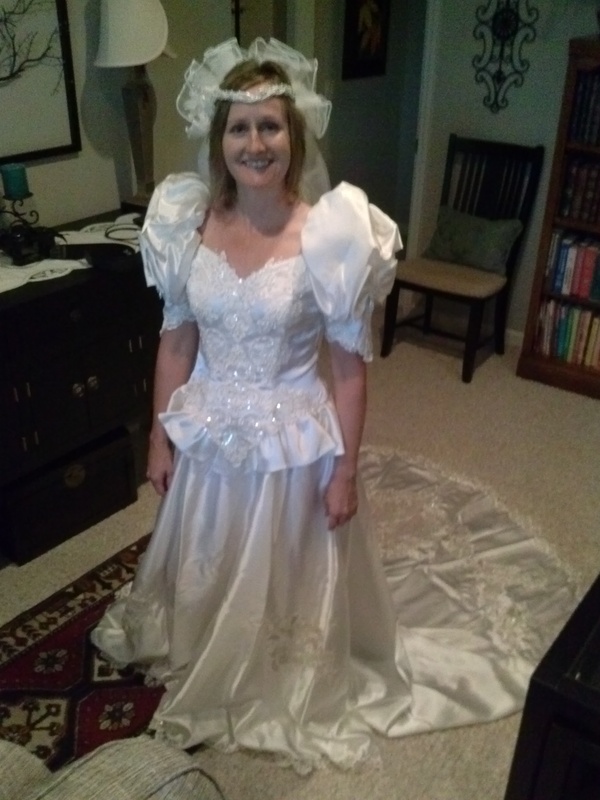 Yes, the sleeves are a bit poufy and 90s-looking, but the gown is still stylish twenty-plus years later. Also, look at you! Your critical view of your body robs you of the joy of this special day. Believe it or not, you will fit into your gown after giving birth to two children and all the years in-between. Stop focusing on whether or not your face looks fat when you smile, and instead focus on the gravity of your vows. You are beautiful. Your soon-to-be-husband thinks so too. Perhaps even more pressing than dress design and fit, is your stilted view of the Christian life. You seem to have two categories for life—your spiritual life and everything else. God is Lord of all—your work, your marriage, your home, your leisure, your relationships. There is no delineation between sacred and secular. Stop viewing your relationship with God as an item to check off a to-do list. Instead, look for ways to encounter God in your everyday moments. Sharing a meal with friends around a table is sacred. Noticing a beautiful sunset and thanking God for it is an act of worship. Rocking a child to sleep for third time in the middle of the night is sacrifice. God is present in those moments just as he is when you read from His word. When you seek to meet God in the everyday moments, you will discover a life filled with God’s presence—even in the midst of the ordinary routines and days. There will be many opportunities for cultivating this practice. So relax. Remember that the life of faith is a journey. “Cease striving and know that I am God,” writes the Psalmist. Take these words to heart. Delight in his presence in the years ahead. I love how you conclude. :”Delight in his presence in the years ahead,” Good advice, at any stage. And I am very impressed you can still fit in your wedding dress! A beautiful message of worth in God’s eyes. We are far too hard on ourselves!! On behalf of the High Calling, thank you so much for participating in the Link Up . All week long we are delving into this topic, so check back often at http://www.TheHighCalling.com. Your post, along with others, appears here. http://new.inlinkz.com//luwpview.php?id=436727.